Make it happen, Poland! is a result of the thorough analysis of Central and Eastern European market. Grounding their findings in vast sets of conferences, interviews and research studies, Bright Side® came up with a vibrant, fresh and analytical program Make It Happen, Poland! Choosing as the facilitators of the program its European Partners, Katarzyna Mika and Susan Pilch, Bright Side wants to meet all the needs of Polish market and the leadership teams which are seeking a thorough analysis and comprehension of their current state. The Make It Happen, Poland! program is rooted in the understanding of the urge of Polish leaders to receive a trustworthy and thorough analysis of the present state of the motivation, alignment and commitment of their executives. Only by reaching the awareness of the current state can we reach the goals of higher productivity, innovation- oriented approach and embrace the necessary strategic tools to reach those objectives at an accelerated pace. Bright Side implemented the premises of its Gap Closing Model® – a highly successful behavioral strategy, in order to create an awareness building program for Polish executives and company owners. It is based on the observation, behavioral interviews and Focus Groups which lead the Facilitators to putting together an insightful report on the current state and the desired future outcomes. Through a set of recommendations included in the final summary, Bright Side provides the client with the most effective ways of closing the breach between where the company currently IS and where it seeks TO BE, reaching their goals of higher productivity, costs decreasing or increasing revenues using the Bright Side techniques and experience of being an accelerator, measured by business results. High level of trust given to Bright Side over the three decades of its presence on the international market provides a guarantee for the results of Make It Happen, Poland!. The opportunity to employ the patented set of investigation and analysis techniques as well as receiving a personalized and adjusted set of recommendation is what has given the Make It Happen, Poland! the acknowledgment and recognition of the CEOs and Leaders of a vast number of international companies which are present on the Polish market. 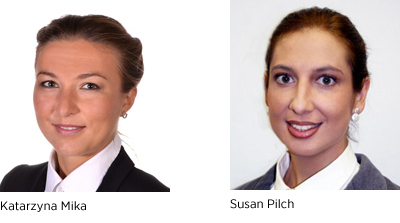 Katarzyna Mika and Susan Pilch managed to create a highly proactive team which grounds its strength in the deep knowledge of business strategies in Europe and US, culture clashes among them and behavioral transformation tools. Their background of Polish and Spanish Universities and work environments enter the world of business with the strength of experts in transformation processes, business analysis of strategies and goal achievements. Katarzyna Mika, following a professional path as a psychotherapist, coach and facilitator of individual and team change processes, expends her experiences into a business environment. She is specialized in delivering scientific approach to the field of leadership development and team building. Her scientifically rooted approach towards people, helped her adjusting the behavioral tools to every singular business situation she and Pilch are required to help with. Susan Pilch grounded her experience on several accomplished business projects in Poland, Spain, Belgium and Italy, where she would always strengthen the necessity and urge of awareness building among the leaders and executives, being herself ready to become the catalyst of that, so much required, change within the European business world. Multi-linguistic capacity of communication helped her establishing and debriefing all the needs among the leadership teams of the companies she was asked to collaborate with. Within the framework of Bright Side, Mika and Susan created a vibrant and analytical program, adjusted to the needs of different markets, being their area of expertise Central and Eastern European business market.